This very special set of prayer beads, or Spirit Beads, has just been listed in my Etsy shop. 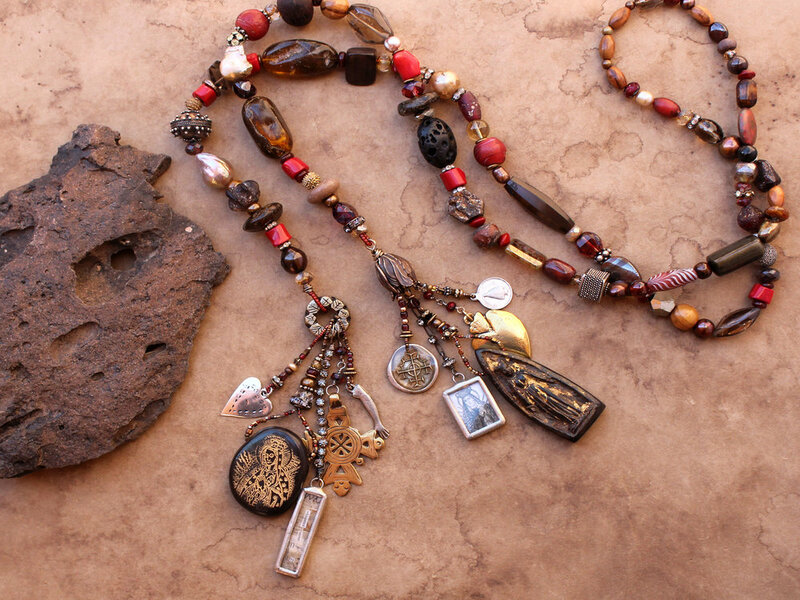 It was modeled after my own set of Black Madonna beads and is even larger and more elaborate, with vintage, antique and handmade elements that are one-of-a-kind. It is a very powerful offering. A very rare and stunning type of oolite…wow. 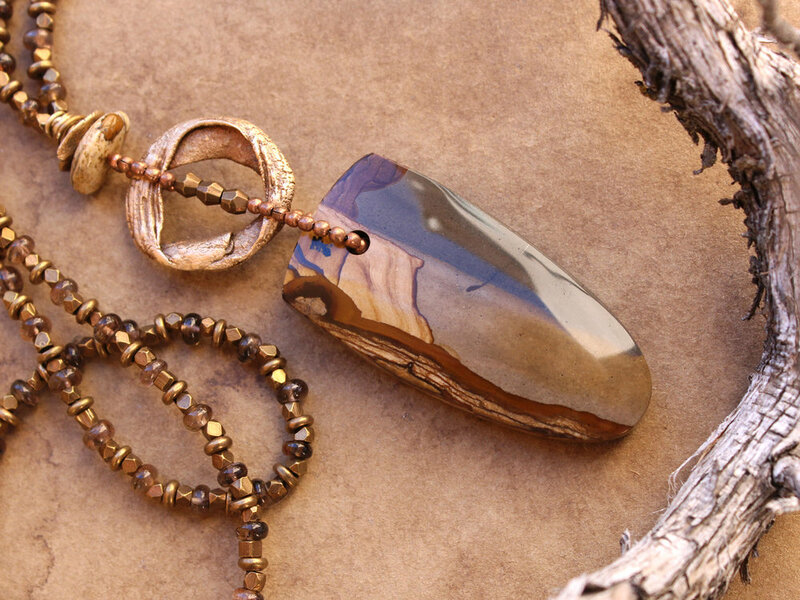 I just love this stone! Tiny seed pearls cluster together on these unusual hoop earrings! I love the sinewy lines of these mimimalist silver bangles. 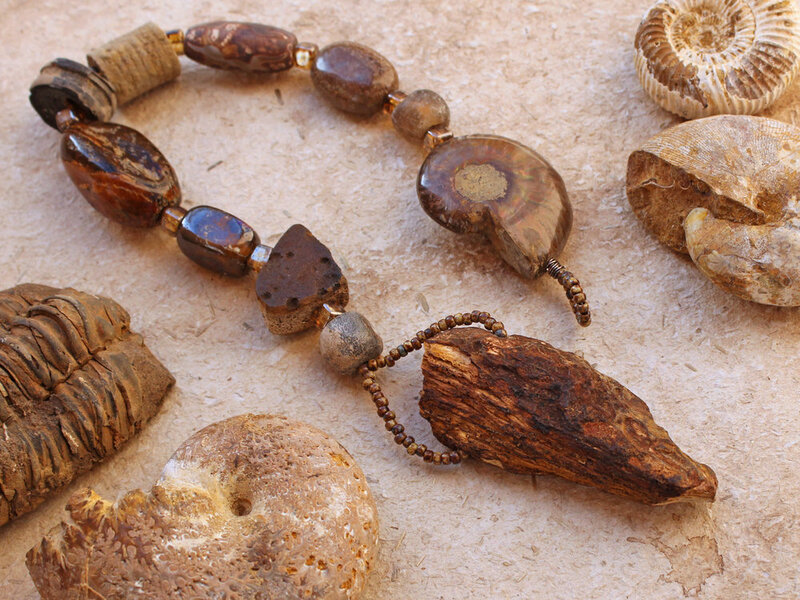 They capture the raw essence of the desert so beautifully! This one for you today…more are on the way! Here’s one from the warm deserts of the far West…. I have several new sets of Spirit Beads that are going into my Etsy shop. Be sure to take a look! And more are on the way…I think we could all use a little mindfulness, tranquility and perspective these days. Happy New Year, everyone! 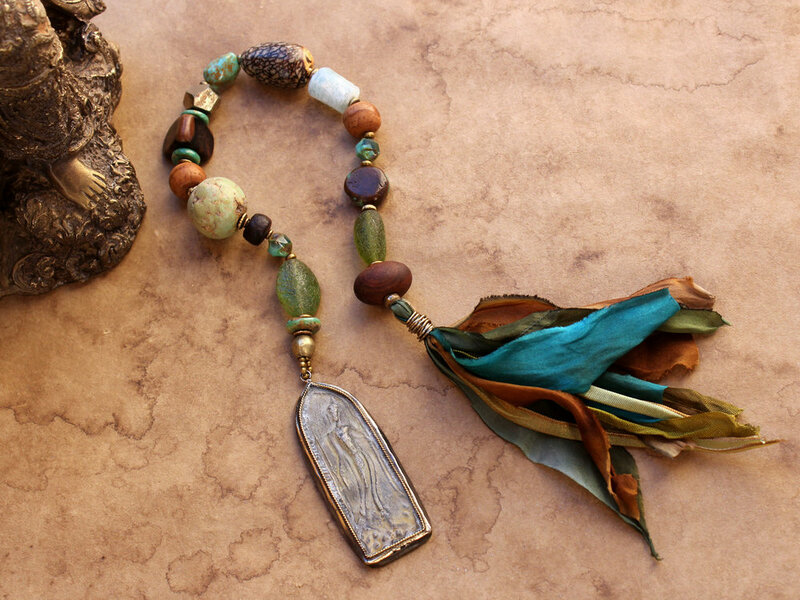 Here’s a necklace that looks like something worn by a wandering shaman of the desert, who gathered talismans here and there and added them to her power piece. I have also started out the new year with several sets of Spirit Beads and handheld prayer beads! 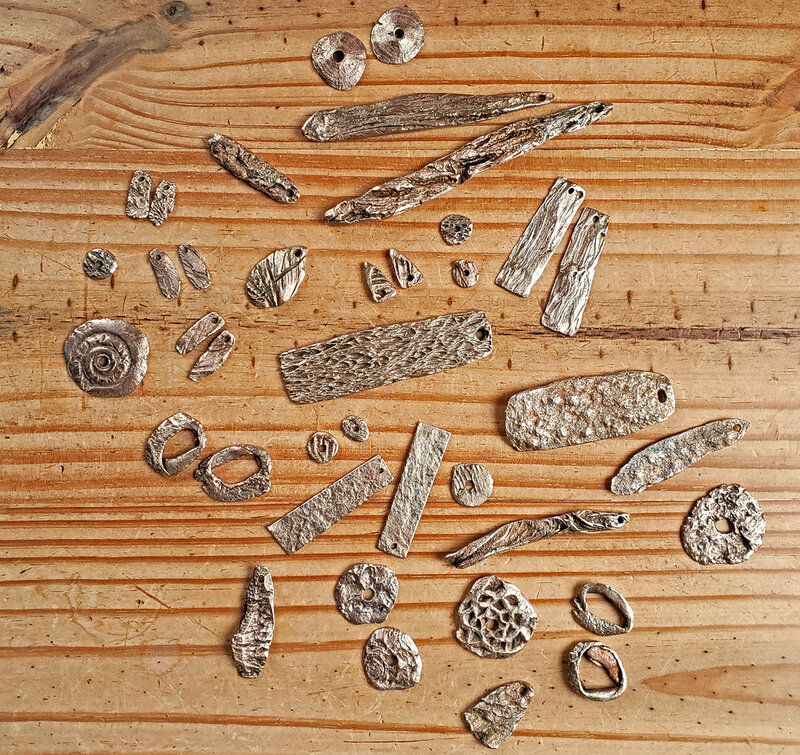 These will be appearing soon over in my Etsy shop, Desert Talismans. Hello folks, and I hope you all have been enjoying your holiday season. I have been enjoying some quiet time and spending many days in the studio, as we have been having some extremely cold weather and our first real snows in several years. As we move into the New Year I wish you all the very best for a healthy and luminous one! I have two new necklaces listed and a third ready for its photography, but for some reason the computer won’t let me create a link to the listings as it usually does, so I have to work around it. Here they are! Two wintry beauties for you today! More to come…. I have one of my new polymer pieces (which in no way resembles polymer!) in the shop for you today. I feel this is a very successful piece, “perfect for what it is”, with that sense of complete integrity that I love seeing when it happens. Earth + Winter + Elemental. Also, it is with much sadness that I have to share that my Dad passed away in his sleep this past weekend. He was quickly failing from Alzheimer’s but nevertheless his departure was a shock to us all. I have spent much of this week on the phone with various relatives as funeral arrangements have been made, and I will be flying out to Chattanooga, his home of many years, next weekend. Because of this, I will not be able to ship orders between December 6-9, but will resume on Monday the 10th. I just wanted to let you know because I don’t want to leave anyone in the lurch during the Christmas season. More work will come as I soon as I can do it! Also, an update on my shipping policy: in the interest of cutting costs in order to make my talismans more affordable to you, I will no longer be shipping items with full insurance. This has gotten very expensive, and in all the hundreds of boxes I’ve sent through the Postal system, I have never lost a package. The only one that was lost was being shipped to Costa Rica and disappeared after it left the country. So from here forward I will be shipping via Priority Mail, in the same boxes, and it will still have a tracking number for you. If you would like to have an item insured, please let me know and I’ll invoice you separately for shipping.